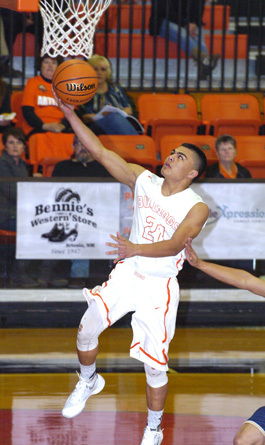 Carlos Carrasco sails in for a layup off the steal during the first quarter Tuesday against Ruidoso at Bulldog Pit. Considering Tuesday’s season-opening contest against Ruidoso was essentially the Bulldog basketball team’s first official practice, the 30-point victory that resulted was a satisfactory outcome to say the least. With numerous players fresh out of the Artesia football team’s state championship season, the Runnin’ ‘Dogs showed a few signs of rust here and there but dominated overall. The boys in orange charged out to a 20-2 lead in the first quarter and were up by 17 at the half, spreading the scoring wealth around between nine different athletes. “I’m really excited about the effort we showed all night,” second-year head coach Michael Mondragon said today. “I thought everybody that got in played extremely hard, and I really liked the way we shared the ball. The Bulldogs’ quick start was fueled by six points from Justin Houghtaling and four apiece from Ethan Duff and Tim Morrison. Artesia set the run-and-gun tempo early and were able to convert on several forced Warrior turnovers. The offensive pace slowed slightly in the second quarter as Ruidoso standouts Trent Platta and Randall Poor Thunder stepped up in an effort to calm their squad, bumping the Warriors into double digits, but the ‘Dogs still held a comfortable 29-12 lead at the half. And although Ruidoso would post its best offensive quarter of the game in the third with 13 points, Artesia went back on a tear. Bruce Bates delivered eight points and Carlos Carrasco seven in the 25-point period, which included treys from both Carrasco and Carlos Caldera. Up 54-25 going into the fourth, Carrasco tacked another pair of longballs to his tally as the ‘Dogs sped up the final four minutes of play with the mercy-rule clock before closing out the 64-34 win. Carrasco led the team in scoring on the night with 15 points, followed by Bates with 11, Houghtaling with eight, and Duff with seven. “Obviously, we still have some stuff to go over,” Mondragon said. “We have to get guys familiar with the plays, take care of some of those things we didn’t execute as well as we need to last night, and we need to do a lot of shooting, getting used to handling the ball. The Bulldogs will kick off their City of Champions Classic run at 8 p.m. Thursday against Chaparral at Bulldog Pit, following both the dunk contest at 6 p.m. and the Lady Bulldogs’ 6:30 p.m. game against El Paso Bowie. “I just hope to see us do a better job of executing in the half-court set, especially on the offensive end,” said Mondragon. “We need to do a better job of taking care of the ball and just continue to play hard.